Note: At that time, the first time in Y's 130 years that it opened a Y in a developing community. For the Palm Coast YMCA, there aren't enough days in the month, nor hours in the day to provide time for all its activities. The YMCA has a variety of programs for the area residents from oil painting to weight lifting. A typical Monday morning at the YMCA begins at nine when the three and four year olds arrive for preschool classes. In another section of the YMCA building Jarly Jackson, a 70 year old former acrobat, is teaching exercise class. After a lunch break, it is "children's fun time." During this time there are also weight lifting classes in the next room taught by Tim Shanahan. From 4-5 p.m. there is after school play hour for the school age children. After dinner activities begin again with square dancing at 6:30. The evening ends with a youth rap session from 7:30 until 9 for the teenagers, and German lessons taught in the next room by Anne Russell. All day people are in and out of the YMCA building, coming also to watch television, play billiards or ping pong. Also, many organizations hold their meetings in the large multi-purpose room of the Y. 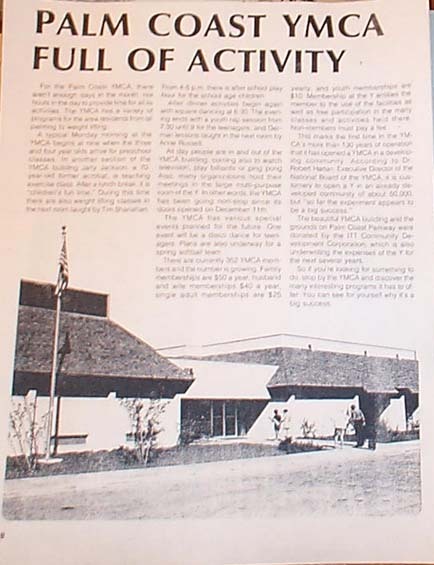 In other words, the YMCA has been going non-stop since its doors opened on December 11th. The YMCA has various special events planned for the furure. One event will be a disco dance for teenagers. Plans are also underway for a spring softball team. There are currently 352 YMCA members and the number is growing. Family memberships are $50. a year, husband and wife memberships $40 a year, single adult memberships are $25. yearly, and youth memberships are $10. Membership at the Y entitles the member the use of the facilities as well as free participation in the many classes and activities held there. Non-member must pay a fee. This marks the first time in the YMCA's more than 130 years of operation that it has opened a YMCA in a developing community. According to Dr. Robert Harlan, Executive Director of the National Board of the YMCA, it is customary to open a Y in an already developed community of about 50,000 but "so far the experiment appears to be a big success." The beautiful YMCA building and the grounds on Palm Coast Parkway were donated by the ITT Community Development Corporation, which is also underwriting the expenses of the Y: for the next several years. So if you're loking for something to do, stop by the YM:CA and discover the many interesting programs it has to offer. You can see for yourself why it's a big success. Excerpt from: 'The Palm Coaster', published by the Corporate Communications Department of ITT Community Development Corporation for Palm Coast property owners, purchasers and homeowners, as well as their families and friends. Vol 7, Number 2, Summer 1978, p. 8.